ABSTRACT: The results of a high-resolution multidisciplinary stratigraphic study of a lower Langhian succession, located in the Hyblean Plateau (SE Sicily, southern Italy), are here presented. The about 33m thick succession, which belongs to the “Ragusa Fm” (Auct. ), has been recovered through a continuous coring survey and highly-spaced sampled. A total amount of 281 samples has been collected at an average interval of about 12cm for the following analyses: quantitative calcareous nannofossil and planktonic foraminifer biostratigraphy, paleomagnetism, CaCO3 content. The distribution pattern of biostratigraphically significant taxa was reconstructed and paleomagnetostratigraphic data provided temporal constrains. Cyclostratigraphic reconstruction and astrochronological calibration of the section are proposed, based on the available bio- and magnetostratigraphic data, combined with the fluctuations of the Calcium carbonate content. Our results demonstrate that the section entirely falls within the magnetozone C5Br and spans the interval from 15.163 to 15.968 Ma. High-resolution stratigraphic data for the early Langhian time interval, including a set of well established calcareous plankton events, are provided. 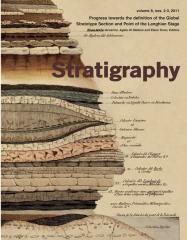 Thus, the present section plays a strategic role as correlation tool among different coeval successions, in the framework of a wider project aiming at the definition of the Global Stratigraphic Section and Point of the Langhian Stage.